Finished my shift at work and literally ran to the link station to potentially catch an earlier flight. Somehow, I managed to switch on 20 min before boarding started. Me being me, I kept thinking something bad would happen because I didn’t have a chance to get my pre-flight frosty and fries from Wendy’s since I RAN through security straight to the gate. Anyway, the flight was quick; landed, found mom and drove directly to Abbot Kinney to grab dinner. I was STARVING, on the verge of hangry, tired, and restless. This, coupled with the fact that I’m not the best navigator and mom was driving and an even WORSE navigator, I joked that two negatives make a positive and we somehow made it to the restaurants in no time. First stop was Gjelina (which is supposed to have one of the best brunches in LA) where the wait was 1.5 hours on a Wednesday evening (????). The hostess directed us over to their takeaway restaurant right next door if we wanted something to tie us over. I wanted something to tie me over. Mom grabbed a miso cookie which was bomb and I scarfed down a huge slice of pizza topped with escarole, mushrooms, onions and god knows what else - I just ate it all. With our name on the waiting list, we walked down the main street and window-shopped since all of the stores had closed for the evening. As we made our way down the road, we stumbled upon The Butcher’s Daughter and scratched our original plans at Gjelina to eat here instead. Lemme just say that the Butcher’s Daughter is completely vegetarian, despite the name, and also has the cutest little interior you’ve ever seen. Aesthetics aside, mom and I perused the menu and settled upon a mushroom-truffle pizza topped with arugula and artichoke drumsticks. The drumsticks were wild and by now my hunger had finally subsided. We ended the night the only way I know possible and that’s with a scoop of ice cream. I popped Jeni’s Splendid Ice Creams into Waze and crossed another LA ice cream shop off my list. I ended up ordering melted chocolate and vanilla (go figure). We finished our ice cream and went over to UCLA to give Gina boxes to pack her things and meet some of her friends. The next day was the intended day to move a lot of Gina’s stuff out of her dorm. Gina was hanging out with her friends and packing that morning, so Mom and I took advantage of the free time. When in LA, you always check out the walls. The iconic pink wall at Paul Smith had just been painted rainbow for PRIDE and right across the way was a Snoop and Martha promotion on the Carrera Cafe wall. We rolled down Melrose for our morning coffee and breakfast at Verve Coffee Roasters while spotting an actor and youtuber. The coffee was amazing, a great contender with our usual Alfred coffee. More amazing was the avocado toast we split, topped with radish and onion. Mom and I attempted to play a car counting game as we sat out on the patio enjoying our meal. The premise was to count how many BMWs and Mercedes passed by. Right as I defined the rules of the game, a BMW drove down the street and we were at one. For the next ten minutes the shittest cars in all of LA drove past us which was hilarious. All of these high end cars are the everyday norm in LA, but not in this moment. The morning pressed on, and we headed over to Brentwood to grab Gina and then drive to the MUSEUM OF ICE CREAM. I’m sure you know by now that ice cream is kind of my thing. Last year, the museum was in New York for a month or two and I legitimately considered flying to NYC for 24 hours to just go to this museum. Well fast forward a few months and the organizers designed one for LA and Gina bought tickets last month and called them my graduation present…THANKS PAL. We had no idea what traffic was going to look like and made it there an hour early. To kill time, we wandered the area in the scorching heat. Emphasis on scorching, I was glistening. Nearby was this rad cafe/store/studio place called the Springs and bopped around in there for a little bit. Right behind the little complex is an old favorite wall of ours by the Most Famous Artist who is channeling some serious Damien Hirst (one of my favorite artists!!!) vibes. We headed back to the museum and hung out in their little garden games area and got shocked by the electrically charged bougainvilleas (yeah it was weird). Also, for the record, Gina and I are HORRIBLE at corn hole. FINALLY it was our allotted time to enter the Museum of Ice Cream. I was so giddy and rivaling the 7 year olds we were walking in with. As we entered, there was a little kiosk full of chocolate and walls covered with sweet designs. Opposite of that wall was geometric pink wall (homage to one of famous doors in Palm Springs maybe?) where we entered for more ice cream goodness. The next room was pink floor to ceiling accompanied with pink telephones where someone was saying something on the other line, but it was quite muffled so it really didn’t matter. Continuing onto to the next room, we entered the LA personified with ice cream: sidewalk stars with ice cream actors, pink palm trees, and the Hollywood sign. Here we were able to get a scoop of the flavor of the day: Salt & Straw Salty Caramel with Ribbons - it’s like they knew I was coming, that’s my FAVORITE flavor at Salt & Straw. Moving on, we stumbled into the banana room accompanied with swings, mint room which was reminiscent of a dispensary but smelled great with the mint/chocolate combo, and sherbet room where one of those stupid crane games was that everyone always loses. Everything was AMAZING. The amount of imagination and execution to make this happen is incredible. Plus, nearly in every room there was something to do or a sweet to try. Right after we wandered through giant popsicles, we snacked on gummy bears in the gummy bear room. Honestly, this whole place was one major photo-op but I’m not complaining. It was fun to come up with different poses and admire the art. Nearing the end, we entered a black and white room where we at charcoal cookie dough (my least favorite) but artistically this place was on point. The very last room was the FAMOUS sprinkle pool where basically all of my dreams were realized. We “dived” right in to the colorful pool which was surprisingly deep and enjoyed the novelty of the whole situation. Let me tell you, I WAS LIVING. Once our time was up, we shook off all of the sprinkles and headed into the gift shop area where there was an ice cream sandwich swing, ping pong table, and breakfast ice cream sandwiches which were pink pancakes with vanilla custard in the middle. Amazing. Absolutely amazing. 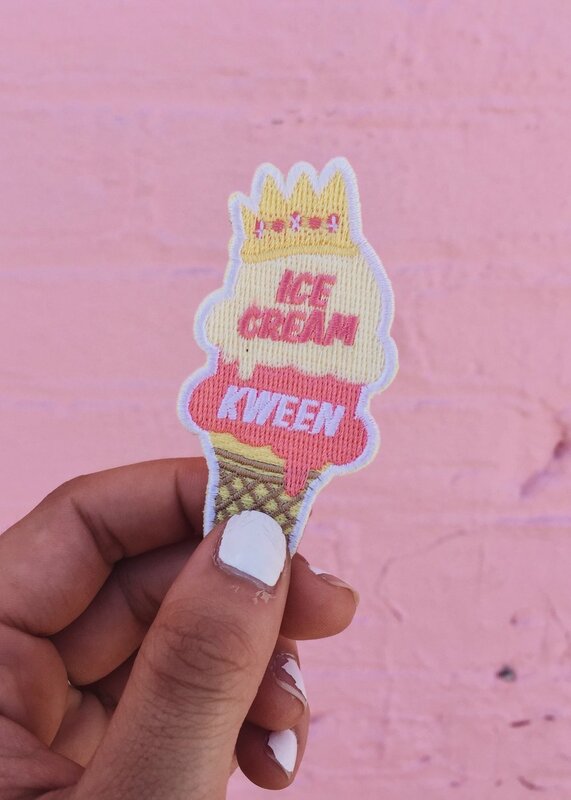 I had to get a few things from the gift store for obvious reasons and opted for this ice cream kween patch. WOWOWOW. What a day so far. And it only got better. Next up on the agenda was 14th Factory, a temporary art gallery/exhibition space spearheaded by Simon Birch in collaboration with other 20 other artists. I had no idea what to expect because I had only seen a few images on the website and social media plus a few reviews that said it was really dark. What the heck does that mean? Well we were off to a bad start as we drove past the place twice. Eventually we got there and it kind of seemed abandoned and barren with plywood painted black and the 14th factory logo. The ominous facade had black and white flags drifting in the wind, but I had bought tickets so we were going. As we entered, it was pitch black minus the small string of lights on the floor to guide you through the space. Strange sounds played in the space which made it 1000x more eerie. Along the way we passed a lit painting and were lead to screen playing an infinite loop of an image. Further along, we entered a slightly more lit place with tons of geometric jagged shapes piled at the center. As we rounded the corner, we realized that we were able to go inside and were startled by what actually was inside. The bright bedroom was opulent, yet it felt like a scene out of a horror movie. Whatever, we obviously didn’t die and we analyzed the ornate furniture and paintings before moving on. The dark, creepy hallways ceased and we entered the main, central space with dirt rolling hills and swings, photographs, drawings, and paintings. From here were many outlets to find more throughout the giant warehouse containing more sculptures and videography. One of my favorite rooms housed The Crusher where hundreds of rakes hang from the ceiling. I figured out that some of my favorite art is usually composed of repetitive motifs. Continuing with the repetition, Gloria Yu’s crown designs were probably one of my favorite pieces of art. Gina and I remarked that this felt like a scene right out of Game of Thrones. Her 40 crowns, all are different, sit on pedestals at varying heights and consume the space. Each is composed of it’s own unique shape, size or material all gorgeous. Curious about more of Yu’s work, I found out that she specialized in headdress design which absolutely makes sense. Another rad piece was videography where we returned to a dark room accompanied with four screens in a circle as best as you can do a circle, playing images of Hong Kong buildings. The craziest part was the speed it was being played at as it felt like you were moving up in an elevator. We made our way outside to find even more art. This large pool of water is dotted with rusting airplane wings that are reminiscent of shark fins. Honestly, this place housed some of the best contemporary work I’ve ever seen in my life. The only way I can describe it is DOPE and that feels like a complete injustice to the artists, but I’m at a loss for words. If you have the opportunity to see it GO. They’re only continuing 14th Factory through the end of July. I wanted to squeeze another museum in for the day, but we (Gina) was pressed for time and I had gotten my museum fix with two solid places. We ran Gina back to UCLA to pack and I diverged for part of the day to go to happy hour with my friend Travis at Gracias Madre. Travis and I had gone to high school together and it had been WAY TOO LONG since we had seen each other. It was awesome to catch up with him and hear about all of his grand plans. He’s killing it at FIDM AND working a full time job all while moving to a new city. I couldn’t be more proud of him! Later that evening, the whole fam went to The Lobster in Santa Monica for a belated graduation dinner. I ordered these fantastic crab cakes and watched the beautiful California sunset over the Pacific. We ended the meal with the crisp and almond thing Thanks Julie, Chris, and Xander for the great dinner! Our final day consisted of relaxation and finishing up packing. Gina stayed in the dorms that night, so mom and I wandered down Melrose to Moon Juice to get our day started. She got “cosmic in a cup” aka coffee while I chose their cacao juice and made it into a shake with avocado. Mom had to help Gina with a few more things and I finagled my way out of it, so I passed the time by wandering West Hollywood on the search for bougainvillea. I also had to run to Gelson’s to get twist ties to which Caroline made fun of my “wild post grad obligations”. The weather was gorgeous and I could not complain about the blue skies, no matter how smog tinted they were. We met up with Caroline for lunch at Belmont and scurried home to get packed up and head to the airport. We probably should have left earlier, but got stuck in traffic. Normally this would be fine, but we were already cutting it close AND for once in our lives had bags to check in. Mom pulled some Mario Kart level turns here and there while cutting across three lanes of traffic. She dropped us off at the ticket counter and hustled back to the rental car offices to get rid of the car. Meanwhile, Gina, dragging one of the bags, and I scurried inside to find the line snaking through rows and rows of dividers. UGH. Then, we realized that we could just do the self check-in kiosks. Well, we were wrong. For whatever reason the machine we had chosen was malfunctioning and the lady at the drop off spot had print out all four tags again. We couldn't catch a break as the line for the one bathroom in the area had an unnecessarily long line or how someone had urinated in the line at security (???). Who knows. It was a weird day at the airport. We settled in at the gate and mom came a little bit after us, just as they were starting to board. This was the closest we had ever cut it and I do not plan on doing that again. Anyway, we were on our way back home to Colorado! 'Twas a fun trip to LA as always.